63 Comments This post may contain affiliate links. Admit it…. Cookie dough was the dessert you licked straight outta the bowl as a kid. Don’t worry, we ALL did it. 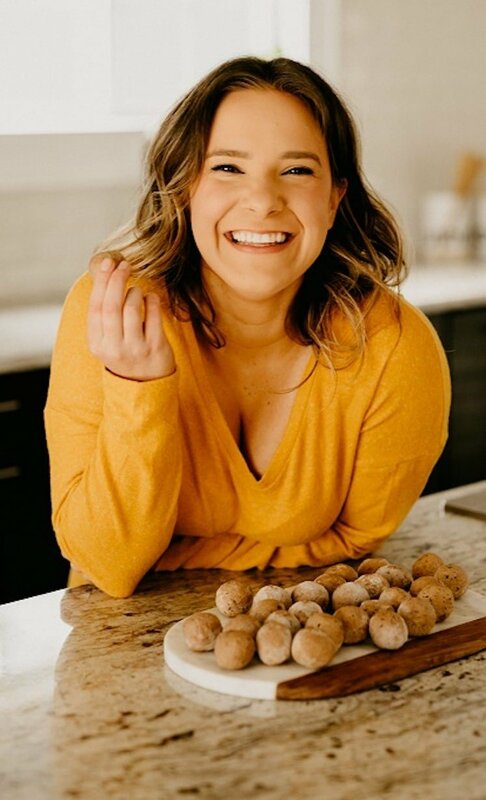 Well, I have some good news for all of my ketoers out there: these Chocolate Chip Cookie Dough Fat Bombs are about to be your new best friend! I am a total sucker for low-carb and keto desserts. I spend my days coming up with substitutions for how to make my favorite sweet treats low in carbs while still tasting like the original, (usually) sugar-laden recipe. 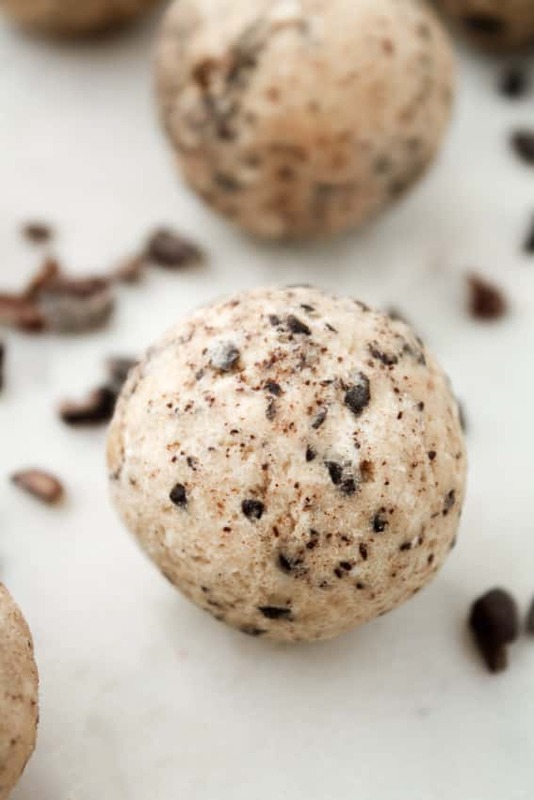 This recipe for Chocolate Chip Cookie Dough Fat Bombs 100% fits all of my criteria! 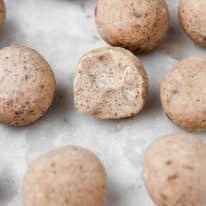 Not only do these fat bombs taste EXACTLY like traditional cookie dough, they are ultra low-carb, take minimal effort to make, and store perfectly! Whip up a batch and keep them in your freezer to pop out whenever a craving hits! Monk fruit sweetener contains 0 grams of net carbs, 0 calories, and rates at a 0 on the glycemic index, meaning consuming it won’t spike your blood sugar. I personally use Lakanto Monk Fruit Sweetener every single day and sweeten virtually all of my keto desserts and fat bombs with it. I love it because it tastes amazing, incorporates perfectly into recipes, and does not kick me out of ketosis! Monk fruit sweetener tastes exactly like traditional sugar and, unlike other low-carb sweeteners, does not leave an aftertaste. I use and recommend Lakanto Monk Fruit Sweetener. You can use code “REALBALANCED” for 20% off your order! Looking for more information on monk fruit sweetener? I wrote a post answering all of your most frequently asked questions. I am also excited to share that I have partnered with Lakanto to share a Taste Test Bundle with you all! If you’ve been waiting to try monk fruit sweetener, now is the time to order! This deal includes classic monk fruit sweetener, golden monk fruit sweetener, a recipe e-Book, and Lakanto’s Taste Test Guarantee! Know more about Lakanto taste test bundle and place your order! 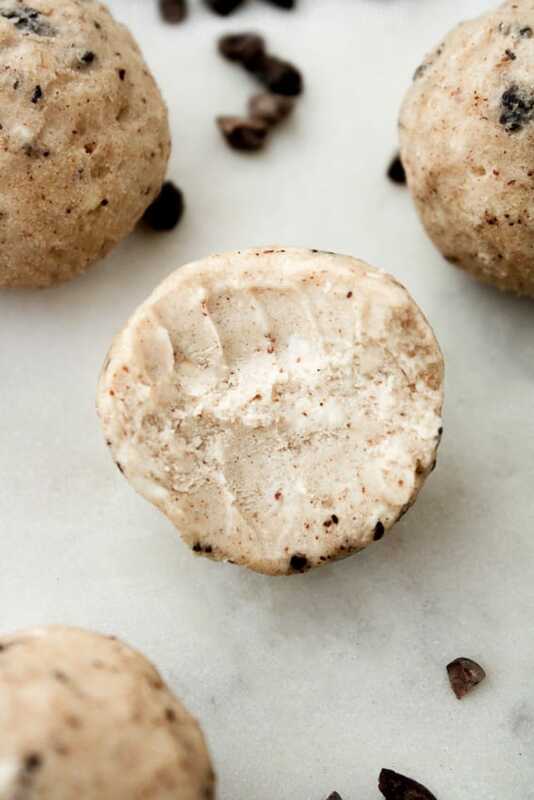 The recipe for these Chocolate Chip Cookie Dough Fat Bombs was crafted with a ketogenic and low-carb diet lifestyle in mind. 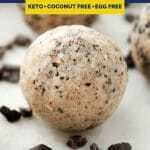 Keto and Low-Carb: One fat bomb contains only 0.7 grams of net carbs per serving. 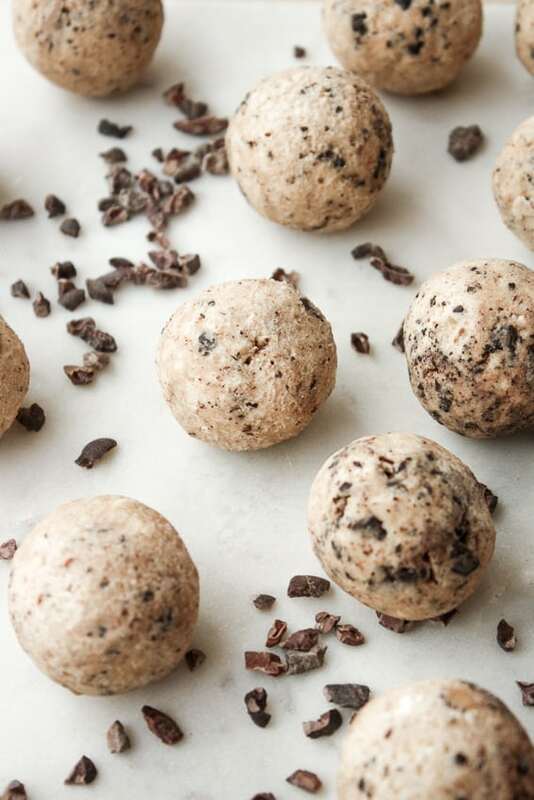 Coconut-Free: There are no coconut-containing products in this recipe for Cookie Dough Fat Bombs. Nut-Free Substitution Available: This recipe contains a nut-free substitution replacing almond butter with SunButter, a seed butter made from sunflower seeds. Gluten-Free and Grain-Free: This recipe is entirely gluten-free, grain-free, and Celiac-friendly. 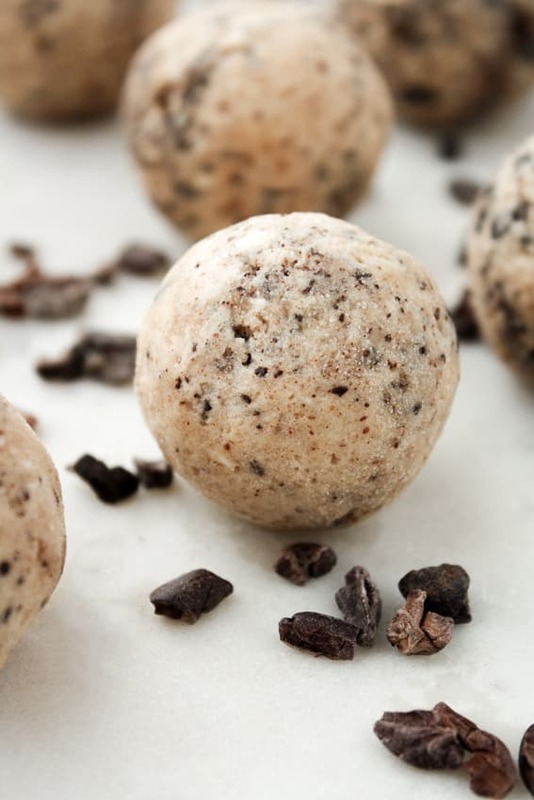 Vegetarian: These fat bombs are compliant with a vegetarian diet. Refined-Sugar-Free: Free from refined-sugar, these fat bombs are sweetened with monk fruit sweetener. One fat bomb contains only 0.7 grams net carbs! This recipe is keto, low-carb, coconut-free, gluten-free, grain-free, vegetarian, refined-sugar-free, and includes a nut-free substitution. 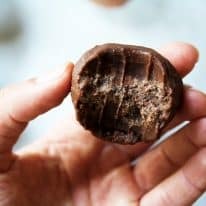 Looking for more fat bombs recipes? 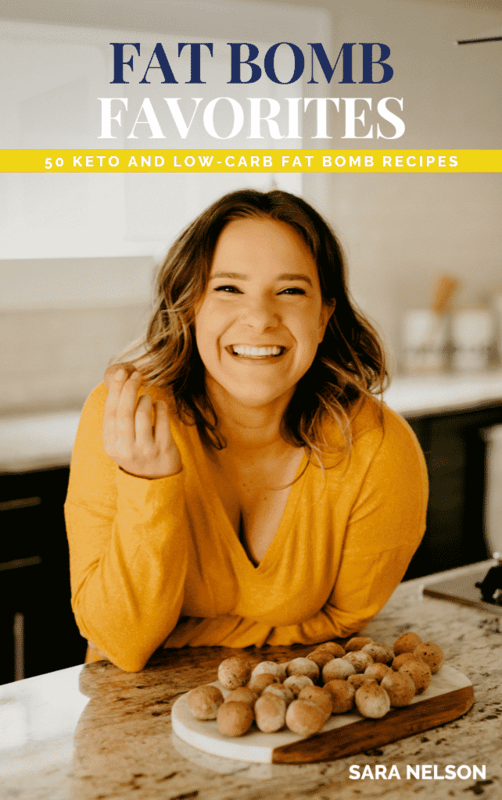 BE SURE TO ALSO DOWNLOAD MY FREE FAT BOMBS RECIPE EBOOK! 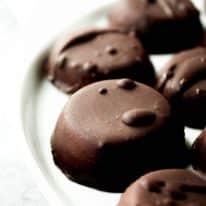 These Chocolate Chip Cookie Dough Fat Bombs are the ultimate keto dessert! 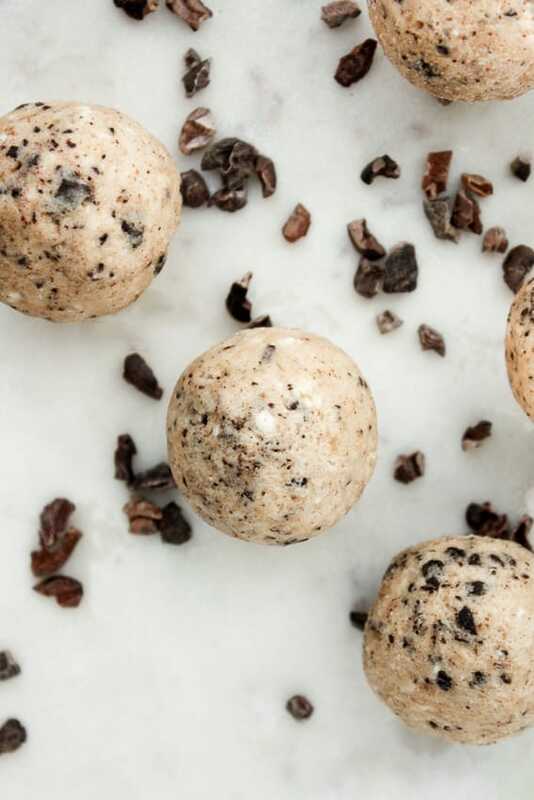 These fat bombs are keto, low-carb, coconut-free, gluten-free, grain-free, vegetarian, refined-sugar-free, include a nut-free substitution, and only 0.7g net carbs! In a mixing bowl, using an electric mixer, mix all ingredients excluding chocolate until well-combined. In a food processor, pulse chocolate until broken into small pieces. Harden fat bombs in freezer for 45 minutes. Store fat bombs in airtight container in freezer. Can you suggest a substitute for the monkfruit sweetener? I have swerve, would that work? Would it a 1:1 substitution? Thanks. I want it now! Should find some time to prepare it too! Thanks for the inspiration! I always laugh when I hear the term “fat bombs”….makes you wonder what it is? These sound delicious, and perfect for on the go!! Hahha! I know exactly what you mean- the name is pretty literal though! Just little balls of high-fat goodness. Just one keeps me full for hours!! Thanks, Gloria! Erin! Hi! I haven’t personally tested this, but I know people will sub coconut butter in for cream cheese. I recommend Artisana’s coconut butter. I can’t say for sure how well this would work though! thanks for your comment!! I tried with coconut butter and they turned out great. I’m so glad, Sarah! Thank you for letting me know! Yessss do it! They are SO SO good. Super simple to make and will keep you full for hours! enjoy & thank you, Catherine!! LAKANTO PRODUCTS ARE THE BOMB – RIGHT?!?!?!? UGH!! I don’t think there is a better sugar-free DELICIOUS COMPANY! RIGHT?! the best company w the best products!! fat bomb for sure!! It looks delicious like it’ll melt in your mouth. This could be dangerous for me. they are soooo delicious! And, since they’re so filling, it’s surprisingly simple to enjoy just one and feel satisfied! but I do recommend eating two, just in case 😉 thanks, Tiffany!! I love all these easy ‘fat bomb’ balls. So quicky and yummy and a perfect snack to munch on. Yesss! So easy to whip up- and they keep you full for hours! thanks, Jen!! What a lovely recipe and beautiful photos! I am leaning towards low carb these days but not sure about Leto being a vegetarian!! Bookmarking this!! thank you, Sonal!! Low-carb is a great way to go! good luck & thanks so much for your comment! !